Ancient Military; Warriors, weapons and strategies. All nations: Romans, Egyptians, Spartans, Aztecs, Germans, Mongols, Slavs, Chinese, Saxons, Hittites, Persians, Celts, Japanese and more. Aztec society was rigid, stratified class system in which each class (or caste) had a roll designed to support the Aztec warriors. Warfare was thus the main driving force of both the Aztec economy and religion. The Aztec Empire was organized with a strong central government headed by the emperor. The priests and a warriors castes came next, they were made up of nobles who enjoyed a high status in Aztec society. These warriors formed a professional core in Aztec armies and were ranked according to their achievements on the battlefield. The bulk of Aztec armies were made up of levies, commoners required to serve time in compulsory military service. Every Aztec male was a warrior and received basic military training from a young age, whether trader, craftsman or farmer. In fact, military achievement, particularly the taking of prisoners, was the only vehicle for upward social movement available for commoners. The Aztec and Mesoamerican militaries evolved on a very different, and incredibly interesting, trajectory than those of the old world resulting in many unique, effective and gruesome weapons and tactics. Painting of a common Aztec spearman levy, a Jaguar Warrior and an Eagle Warrior. Elite warriors emphasized their ferocity and wear the battle gear of their particular military society. The Aztec army was well organized and with a well organized command structure. The common warriors were formed up into companies called Calpulli. Each Calpulli was further divided into fourths and led by nobles from the region were the troops were recruited. The exact size of a Calpulli most likely varied, but they were certainly impressive given the size of the Aztec armies. Twenty Calpultin (plural for Calpulli) were stationed in the Aztec capitol, Tenochtitlan, and led by the emperor’s family. 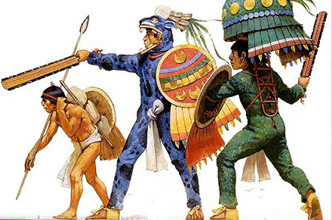 Other smaller units of the Aztec army had strengths of 800, 400 or 200 warriors and were also led by noble officers. The leadership of the army, particularly the generals, would designate a successor before each battle so that if they were killed they could immediately be replaced. Aztec armies were also a companied by priests who carried effigies of their gods alongside the armies. Boys also accompanied the army as porters, carrying weapons and supplies. However the most feared aspect of the Aztec force was their specialized elite units of battle hardened professional warriors. The noble warrior class also formed special military elite units, formed from warrior societies such as the eagle and Jaguar or the dreaded Shorn Ones. Sons of nobles were expected to enter into one of the societies and to progressed through there ranks. Commoners who excelled in warfare would also be allowed to join one of these orders. Each society had different styles of dress, tactics and equipment as well as styles of body paint and adornments. Generally, higher ranking warriors received the right to wear finer and more spectacular attire. Warriors could shift from one society and into another when they became sufficiently proficient in the martial abilities of one group; however, it is not known exactly how this worked. The largest warrior societies were that of the Eagles and the Jaguars. They dressed like their name sake animals and wear headquartered in the Quauhcalli "the Eagle House" located in the ceremonial precinct in Tenochtitlan. Eagles were adorned in eagle feathers and wore headgear with an eagle head on it, their faces looking out from an open beak. Jaguars wore suits made from the pelts of pumas (jaguars) and associated themselves with their god of night. Regalia became more splendid and refined as Eagles and Jaguars increased in honors and rank. To be eligible to join the Eagles and Jaguars a man must capture four prisoners in battle. These visually spectacular warriors were often depicted as statues and in codices. Aztec poetry used the term Eagles and Jaguars to refer to nobles in war. The Otomies were another warrior society, they are named after the Otomi people who were known for being fierce warriors and allies of the Aztecs. It is often difficult to determine if the historical sources are referring to the people or the Aztec warrior society. The Otomi people often fought as allies and mercenaries for the Aztecs adding to the confusion. The Aztec warrior society had the honor of being the first ones to join battle, along with the Shorn Ones, and only those of noble rank could join their society. The Otomi people were one of the early complex cultures of Mesoamerica, and were the likely the original inhabitants of the central Mexico before the arrival of Nahuatl speakers around ca. 1000 AD, after which they were gradually replaced and marginalized by Nahua speaking peoples. The Nahua people included the Aztecs and three hundred years after their arrival they came to dominate the region, however they seemed to have held the earlier Otomi people in high regard as warriors. The "Shorn Ones" or Cuachicqueh was the most prestigious warrior society and the tlacateccatl, a very high ranking general, was always a member. The Shorn Ones are so named because their heads were shaved accept for a long braid over the left ear. They painted their bald heads blue on one side and red or yellow on the other. The Shorn Ones took an oath not to take a step backwards during a battle on pain of death at the hands of their fellow warriors. The officers were recognizable in the battle by their particularly remarkable finery and unusually long wood poles (Pamitl) with the feathers and banners flying from them. They fastened this banner to their back, so that they did not become hindered in battle. The Aztec warriors wore Ichcahuipilli, a quilted cotton armor. These vests were one or two fingers thick, and the material was resistant to obsidian swords, arrows and atlatl darts. The light armor worked well in the hot climate of central Mexico. They also employed small round shields, called Chimalli, made of wood and twisted fibers. These shields featured painted designs and could be decorated with feathers hanging from them. Other shields were made of very thick cotton and could be rolled up while on the march. If a warrior captured six prisoners they could be awarded a carved hardwood helmet. These helmets could have different animals carved into them. The Aztec didn’t know how to forge mettle so they constructed weapons out of wood, stone and Obsidian. The Macuahuitl, a word meaning "hungry-wood", was the standard armament of the elite cadres. It was essentially a wooden sword with sharp obsidian blades embedded into its sides. The razor sharp obsidian blades were placed in groves that ran the length of the blade and held in place by a form of plant resin adhesive. The Macuahuitl could deliver a horrific gash. It certainly could have decapitated a man and was reported to have even decapitated a conquistadors horse. They were made to be either one-handed or two-handed weapons. The two-handed macuahuitl has been described “as tall as a man”. They came in rectangular, ovoid, or pointed forms. The macuahuitl had some serious drawbacks however. The obsidian blades were fragile and could shatter after a single strike. The weapons were also cumbersome and required a lot of space to swing which tended to make it hard for users to stay in formation. The macuahuitl is also known in Spanish by the Taino word "macana". Another ancient weapon commonly used by front lines was the Tepoztopilli. The tepoztopilli was a pole-arm, roughly the height of a man, with a broad spear shaped, wooden head about 6”-8” wide, edged with obsidian blades which were deeply set in grooves like the blades of a macuahuitl. The weapon could be used for slashing or stabbing, it also offered some protection due its superior reach. Aztec warriors also employed clubs with round wooden balls at the ends, clubs with inlaid obsidian blades and hatchets. For long range weapons the Aztecs employed bows and slings. There slings were made out of maguey fiber and hurled rocks. However for midrange the Aztecs used one of their signature weapons, the Atlatl. The Atlatl, also called the spear thrower or dart thrower, was developed to a sophisticated level in Mesoamerica. Using the thrower a great amount of force could be generated, both from the exaggerated throwing motion the thrower allowed and flexing and releasing of the dart. Atlatls achieved greater penetration than bows or slings and the Aztec’s deployed them in mass.